Academic institutions and universities try to build relationships with corporates and industries for accomplishing a variety of objectives. These objectives may include supporting employment for graduates, building a strong way for incubators, sharing expert knowledge and contribute to economic development by working in a systematic manner. In the era of digital technologies, a body of best digital practices for corporate engagement has to be developed and followed by the institutes to sustain in the highly competitive environment. An institute strategic framework built on the principles of digital disruption can provide a smooth roadmap for executing and sustaining successful corporate engagement efforts. It was half past midnight when Vivek Natarajan woke up abruptly, slightly nervous about what was about to transpire the next day at his university. He had worked meticulously to tie up all the loose ends of a deal between Murugappa University, where he worked, and a Chennai based MNC, Virtu Clouds. The deal was aimed at furthering industry-academia collaboration and was meant to benefit its students tremendously. Like his seniors, Vivek knew the stakes were high. After all, as an in-charge of Corporate Relations at Murugappa, he had decided to pursue non-traditional marketing techniques to generate demand in corporate circles. Virtu Cloud was one of the 11 companies who became interested as a result of online campaigns and was interested in partnering with Murugappa for various initiatives such as Student Engagement, Research Collaboration, and Internship Opportunities. Five months ago, Vivek had just returned from the University of Minnesota (United States) from an eye-opening visit. As his alma mater, they had invited Vivek for an Alumni meet, where he witnessed a Hackathon in progress. The University of Minnesota had organized the Hackathon in collaboration with SmartTeams, the largest competitor of Slack, which was a renowned team collaboration app. The winners of the Hackathon would be selected for a 4-month paid internship at SmartTeams HQ at San Jose. The best part? The US-based University had gone completely digital in its corporate outreach program, and it was paying off well for them. Vivek decided to take a quick dive into the need and goals of the corporate relations department in universities and colleges so as to possibly come up with missing gaps in its execution. The Corporate Relations department connects corporate with the resources they need to be successful in a rapidly changing business environment. Whether the corporate was looking to recruit employees from one of the most talented pools of graduates in the nation or want to collaborate with innovative scientists and researchers who constantly push the boundaries of knowledge, the Corporate Relations department is usually positioned to match their needs. Most Indian higher education institutes struggling with the student placements were using traditional marketing methods to contact corporates, that too only for placements and summer internships. Even general perception about the department was that of providing employment opportunities to final year students. What would be the proper strategies for Murugappa University to adopt digital route? What is the probability that things will be in favor of Murugappa University? What would be total cost-effectiveness of digital adoption in comparison to traditional approach? There was another breed of higher education institution that was smart and moved with the changing times. For such institutions, Corporate Relations was not a one-time interaction, an ongoing, year-long activity. Their corporate relations departments kept in regular touch with the department heads, the HR departments and the key decision makers of the corporate houses. They would keep the corporates updated of the latest developments in the campus, communicate via email newsletters, invite them in activities like guest lectures, research, technology exchange sessions, convocation day and prize distribution ceremonies, etc. Such institutions never had to struggle for placements and many of their students would be well-placed. Although Vivek was no stranger to social platforms like Facebook, Twitter, LinkedIn, Instagram and other prominent tools, he never expected to uncover these statistics while doing his study of the usage of social media by corporate and students. Today’s students have grown up communicating and sharing experiences on social media sites like Facebook and are now helping grow the popularity of newer platforms such as Instagram. Using the power of different networks and engaging content, academic institutions are using social media to attract students, interact with current students, increase industry interaction and stay connected with alumni. A report Vivek came across on Times of India, revealed that Indians spend almost 70% of the time on apps like Facebook and WhatsApp, and music and entertainment apps. On the other end of the spectrum were corporates using social media, which played a crucial role in the hiring process with over 94% recruiters using LinkedIn to recruit new candidates, 79% of job seekers using social media to find new jobs and about 13% of social media users saying that the information they posted on social media helped them get a job. What was more interesting was the most of the hiring activities and industry interaction was centered on university fairs and campus visits. Although this traditional approach was effective for years, it’s out of touch with the way students search for colleges and internship opportunities today. Most students were online and connected 24/7. Vivek came across another survey which said 68% students used social media to research colleges and institutions, and another one found that 97% of schools use social media for recruitment, research, internships so really, you’ll be falling behind if you don’t. Vivek’s first task was to rationally chalk down 3-4 ways the corporate can benefit by partnering with Murugappa University. The list contained Student Engagement, Research Collaboration, Professional Education and Internship Opportunities. Vivek set up a social media task force and decided to capitalize on the power of social media and email campaigns. 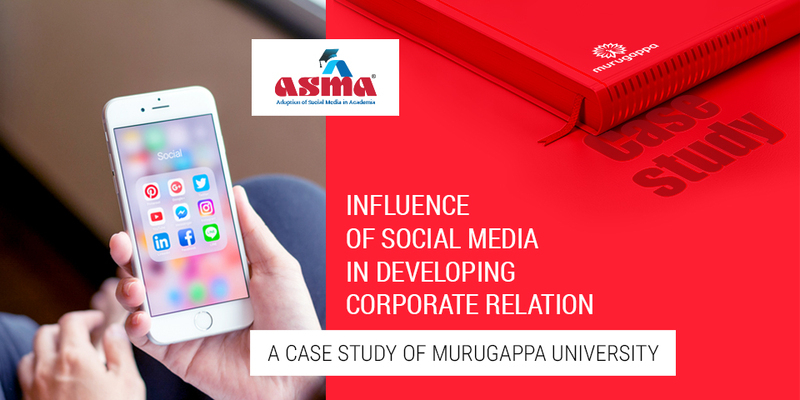 They created social media accounts on Facebook, Twitter, and LinkedIn for Murugappa University, and leverage email marketing to share meaningful content which strengthened institutional branding along with magnifying TalentConnect initiative with the target audience. First, Vivek and his team crafted digital marketing campaigns that strengthened institutional branding, which encompassed showcasing the solid infrastructure, research facilities, vast faculty expertise and tie-up opportunities within Murugappa University. Second, they came up with an initiative called “TalentConnect”, which was aimed at connecting the student talent with the needs of the corporate. Along with inviting the corporate houses to interact with the students, they also invited their trusted alumni to join forces and further amplify the effect. Third, they started sharing campus photos or school events (though these are prominent practices on most school’s pages), Murugappa University learned from other colleges about the power of branding and digital marketing, and shared content that was both engaging and informative, mixing with a modern vernacular of emojis, retweets, hashtags, blogs, live videos from alumni and faculty showcasing the state-of-the-art infrastructure for research and collaboration. Fourth, they harnessed their own students’ usage of social media to create a stronger profile for their institutions at large, in turn drawing in more students and corporate inquiries. Their efforts paid up. Through consistent social media drives and email campaigns, Vivek and his task force were able to generate 11+ high-quality leads in 3 months from the corporate in areas such as Student Engagement, Professional Education and Internship Opportunities. The approximate campaign budget was Rs 1.5 Lakh per month, of which 25% was used to build engaging videos. They were able to close long-term deals with Virtu Cloud and 4 other established companies. The 10% percentile of the class would be awarded internship opportunities, and 15 students from a technology background, would be lucky to be working on world-class technologies like IoT, Machine Learning and Artificial Intelligence. Be active on popular social media channels like Facebook, Twitter and LinkedIn, keep posting, and sharing stories of student’s achievements, events, guest lecture, conferences, and others. Leverage the power of digital media, thinking it an investment for generating incredible output for the future. Top higher education institutions around the globe are using powerful content marketing and email campaigns to strengthen organizational brands on campus and nurture their ties further with the corporates. Conduct workshops on building an online reputation for students and professors, guide them to place themselves well on social media. Keep a tab on current industry practices on social recruitments and adopt changes in the existing placement process. Digital and social media increases collaboration opportunities between corporates and universities for research programs, technologists or particular equipment, or catering to the specific needs of the businesses. * Please note that this case study is a simulated case. It has a high correlation to the practice, but the names are simulated.